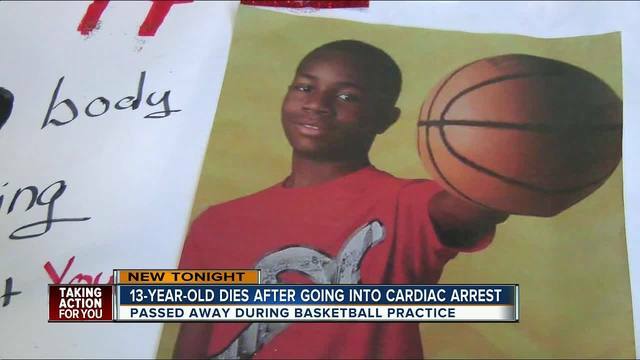 13-year-old dies after going into cardiac arrest during basketball practice. TAMPA, Fla - 13-years-old and already 6 feet 1 inch tall. You bet Alvin Williams Junior dreamed of playing in the NBA. “And a lot of other people believed in him and shared that dream with him because he was so young and his height,” said his mother Topeka Williams. The Tampa 7th grader had just joined a local AAU team and finished his first practice Thursday evening. “He was done with practice. I guess he was going to gather his things and while he was going to gather his things he collapsed,” said his father Alvin Senior. “When I got there he was coming out on a stretcher. And he wasn’t breathing,” said his mother. His parents said they were told Alvin went into cardiac arrest and died. A shocking end to such a young life. “I don’t think it hit me yet that my son is gone,” said Alvin Sr.
Alvin’s mother said he was checked out in the past for chest pains and passed out once after a game. She’s a nurse and took him to a cardiologist. “He pointed out to me what this was and what this was. And that outcome was he had a normal heart for a child his age,” she said. Experts said every three days another young athlete in the US dies from sudden cardiac arrest. And time waiting for help to arrive decreases chances of survival. They say without chest compressions, the victim will likely die. And using a defibrillator doubles the chance of survival. We wanted to know if there was a defibrillator at the gym or if anyone performed chest compressions. But we haven’t heard back from the Skills Center, that overseas the team Alvin played on. Meanwhile, Alvin’s parents are trying to honor their son and remember his winning smile. “That smile will forever be in my heart,” said Alvin Sr.